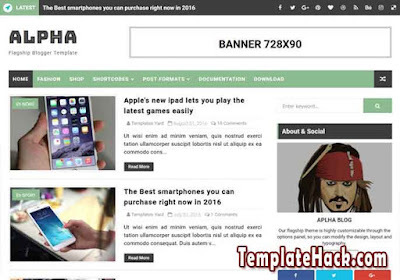 TemplateHack.com - Download Alpha premium blogger template. Alpha is magazine blogger template with simple and great design. It is green blogger template designed especially for news blog, magazine blog, personal blog, tech blog, and etc. It is premium blogger template, customizable blogger template, and designed with html5 base code and you will get many feature to improve your blog visitor. Because, Alpha is designed with search engine optimized feature, responsive, and simple design so your blog can load fastly with this template. Download this template for free, and you will get all amazing thing from its features. Download this premium blogger tempate for free. Clean, SEO friendly, Slideshow, 1 sidebar, 2 column, 3 column footer, Post thumbnails, Responsive, Social bookmark ready, Ads ready, Email subscription, Widget, Page navigation menu. News blogger template, Tech blogger template, Magazine blogger template, Personal blogger template.